Gregory Manchess, Above The Timberline, 2017. Oil on linen, 15 x 37 in. Cover illustration for Above The Timberline by Gregory Manchess, Saga Press, 2017. ©Gregory Manchess. All rights reserved. Stockbridge, MA, October 31, 2018—In his first fully illustrated novel, Above the Timberline, renowned artist Gregory Manchess follows the grand tradition of classic adventure stories, providing both art and story for a tale set in a futuristic world where it has snowed continuously for 1,500 years. 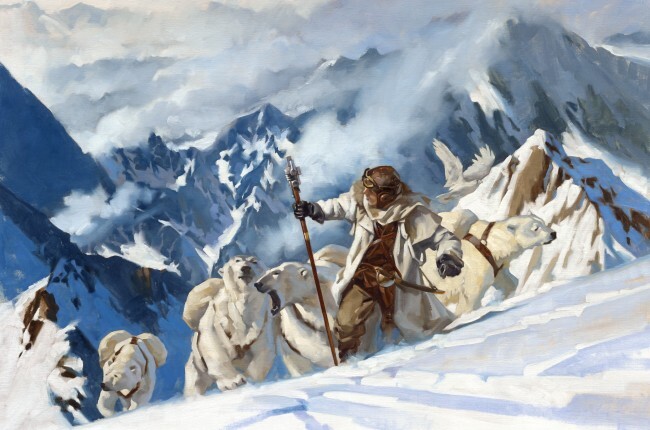 Manchess’s expressive paintings, inspired by the Golden Age of illustration, bring to life the story of the fictional Wesley Singleton, son of the famed polar explorer Galen Singleton. Wesley searches for his stranded father in a lost city while responding to elements both adversarial and welcoming—and finding his own sense of identity and family along the way. This fall and winter, the Norman Rockwell Museum takes visitors on a journey through this imaginative tale with the exhibition Gregory Manchess: Above the Timberline. With 30 paintings, as well as props, archival materials, photographs, and behind-the-scenes videos exploring the artist’s process, the exhibition explores the art and ideas that inform this vivid tale. Life-sized sculptures of characters (including polar bears) will also be on display. On view at the Museum from November 10, 2018, through February 24, 2019, this exhibition has been organized by the Norman Rockwell Museum, and curated by Jesse Kowalski, the Museum’s Curator of Exhibitions. The exhibition includes the painting the book’s striking cover-illustration, featuring young Wesley traveling through the snow-filled landscape with a pack of polar bears that will become important supporting characters in this adventure tale. This lavishly painted work, originally created for a painting workshop taught by the artist, served as inspiration for the artworks and book to follow. Manchess’ loosely painted style brings a sense of imaginative wonder and brisk atmosphere to the oil-on-canvas and linen works displayed in the exhibition, and his background as illustrator for the National Geographic Society seems to have served him well in the creation of a novel that draws upon his passion for history and detail. Gregory Manchess, Bears Appear, 2017. Oil on linen, 15 x 37 in. Illustration for Above The Timberline by Gregory Manchess, Saga Press, 2017. ©Gregory Manchess. All rights reserved. Award-winning illustrator and painter Gregory Manchess has worked for nearly forty years on advertising campaigns, magazines, and book covers. His work can next be seen in the upcoming Netflix series The Ballad of Buster Scruggs, by filmmakers Joel and Ethan Coen. Manchess’s work has appeared on covers and for feature stories in National Geographic Magazine, TIME, Atlantic Monthly, and The Smithsonian. The artist’s masterful figure work has led to numerous commissions for stamps by the U.S. Postal Service, including the Mark Twain stamp and the recently released March On Washington stamp. National Geographic Society, to which he is a frequent contributor, sent the artist on expedition to record the exploits of explorer David Thomson for a 1996 article, and chose his work to illustrate the adventures of the first discovery of an actual pirate ship for the traveling exhibition Real Pirates: The Untold Story of The Whydah, from Slave Ship to Pirate Ship. The artist’s work has been previously exhibited at the Norman Rockwell Museum; the University of Findlay’s Mazza Museum; and at New York’s Society of Illustrators, which presented the Manchess with their highest honor, the Hamilton King Award. Manchess lectures frequently at universities and colleges nationwide and gives workshops in painting. Learn more about his work at www.manchess.com.